Sienna 900mm Gloss White Furniture Pack - Only £319.99! Pack includes toilet and tap pictured below, all for one great price! The Sienna 900mm Gloss White Furniture Pack is one of our most popular items for those looking for function and design. This fantastic furniture set comes with some great storage space underneath the basin, allowing your bathroom, cloakroom or ensuite to be clutter-free. This is a great-looking, very reliable, practical and well-made furniture set - such is the quality that it comes with a fantastic 5 year guarantee as standard. A superb furniture pack with great storage, high quality manufacturing and a very low price. 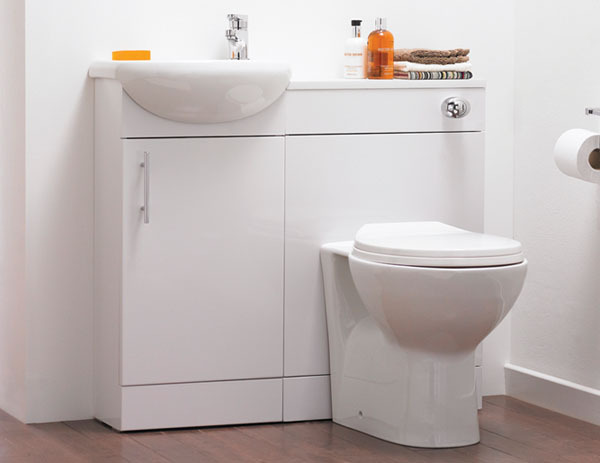 This furniture set is perfect for smaller cloakrooms, totalling 900mm wide and the suite can be split up into a basin unit and toilet for those with awkwardly shaped cloakrooms. It is popular with our customers because of its ability to provide a high level of storage space, while taking up a minimal amount of room. If space is at a premium, this excellent furniture pack will be the ideal solution. 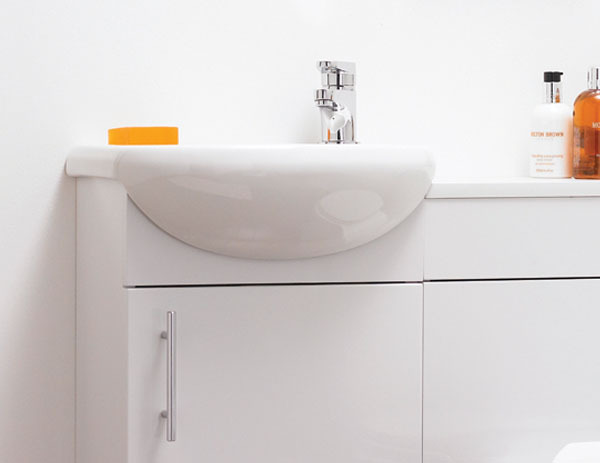 The Sienna white vanity unit is the ideal solution to utilising the space you have in your bathroom. It offers innovative storage for effective functionality and a superb finish for added style. Perfect for the clean and contemporary look, it delivers everything you would want in the bathroom and more. The WC pictured is included in this pack as standard. It is high quality, extremely modern and easy to clean. The toilet is nice and compact with clean lines. 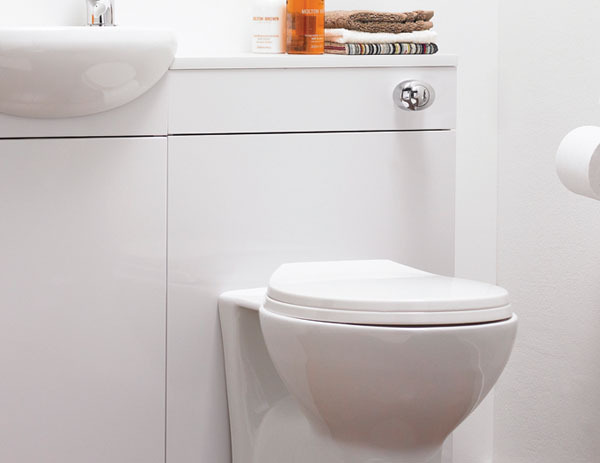 The concealed cistern comes with flush fittings, fit to UK standards. The soft-close toilet seat is practical and stylish. The vanity unit comes complete with the wooden unit, chrome handle and overflow cover and ceramic basin. The D-type mono basin tap with pop up waste shown in the photos above is included as standard. Sadly this product is no longer available. Please contact us on 01942 885700 for alternatives.